Various episodes also deal with the relationship between Mulder and Scully, originally platonic, but that later develops romantically. Mulder and Scully are joined by John Doggett (Robert Patrick) and Monica Reyes (Annabeth Gish) late in the series, after Mulder is abducted. Doggett replaces him as Scully's partner and helps her search for him, later involving Reyes, of whom Doggett had professional knowledge. 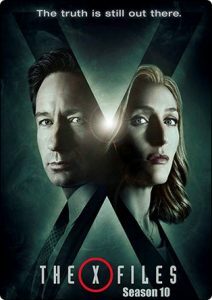 The X-Files ends when Mulder is secretly subjected to a military tribunal for breaking into a Top Secret military facility and viewing plans for alien invasion and colonization of Earth. He is found guilty, but he escapes punishment with the help of the other agents and he and Scully become fugitives.